L-R_ Jacob Sidney, Drew Parker _ Christopher M. Williams - photo by Aaron Rumley. The dynamic duo of master sleuth Sherlock Homes and his redoubtable assistant, Dr. John Watson, M.D. are at it again. This time, however, they spring from the talented brain and clever pen of American playwright Jeffery Hatcher. Mr. Hatcher is a prolific playwright who brings a long list of credits to the North Coast Repertory Theatre (NCRT) stage that span from Broadway to Regional Theatres from coast to coast. He is also considered by many to be an expert on the plays of Sir Arthur Conan Doyle. Whether one is a loyal fan of Sherlockian lore or just discovering the genre, Sherlock Holmes, has been mystifying readers, movie and theatre audiences with his uncanny ability to solve the most difficult of crimes since the late nineteenth century. North Coast Rep artistic director David Ellenstein has a penchant for selecting interesting plays for his theatre audiences. With his selection of playwright Hatcher’s new drama/mystery “Holmes & Watson”, and as the director of this clever play, Ellenstein subliminally tosses out a gentle unstated challenge to his patrons. Can the audience solve this clever mystery before his creative cast does it for them? It may sound easy but the audience has to pay strict attention to what’s taking place on stage in order to win the brass ring of the “aha moment”. Hatcher’s extremely well-plotted play is not easily boiled down to a bare-bones explanation without spoiling some of aspects of the ending. However, the story in short, revolves around three men, residing inside a Scottish insane asylum who claim to be Sherlock Holmes. Sir Arthur Conan Doyle deliberately left his last published episode about England’s fictional greatest detective with an ambiguous conclusion, in case he decided to write a sequel. Hatcher’s intriguing take on the Conan Doyle character brings up the question of Did Holmes actually die at the hands of his arch-enemy Professor Moriarty or is he still alive? What happened to Moriarty? Did he die with Holmes, as both men appeared to have tumbled while struggling at the edge of a mountain waterfall, finally meeting their fates. This is what the audience has to wrestle with and resolve. Everyone likes to play detective and Hatcher’s play and director Ellenstein’s deft staging supply them with plenty of ammunition. What is all the more fantastic about Hatcher’s play is that some readers and audiences to this day, believe that Sherlock Holmes and Dr. Watson were real-life people who lived at 221-B Baker Street in London. Visiting tourists from around the world for years wanted to visit Holmes and Watson’s digs. Ultimately, the London County Counsel turned a building located at 221-B Baker Street into the fictional address and apartment, which looks today as if Holmes and Watson have just left to solve a case; into a money-making goldmine. Such is the power of the pen. But I digress. The play is more of an investigation in its presentation in search of the truth as seen from the viewpoint of Dr. Watson (wonderfully played in a finely nuanced performance by Richard Barid), As the play begins Dr. Watson is talking with Dr. Evans ( played by Si Osborne) about three men who are his patients in the Scottish asylum. Dr. Watson has been called upon to identify which of the three men is the real Sherlock Holmes. Through a series of interviews with Holmes Number 1, played by Jacob Sidney, Holmes number 2, played by Drew Parker, and Holmes number 3 played by Christopher M. Wiiliams along with Dr. Evans’ orderly played by J. Todd Adams, and The Woman portrayed by Alice Sherman, respectively round out the cast. The beauty of this production lies in the performances of this ‘All Equity actor” cast. The technical components of creative team led by director Ellenstein are first rate. The set designs by Marty Burnett, never fail to disappoint, .and Lights designed by Matt Novotny make these two creative artists a formidable pair. The costume designs of Kim Deshazo are spot-on for the period, along with a sound design by Chad Lee Thymes, and hair and wig designs by Peter Herman, complete the creative team. I’m not sure who designed the projections/special effects but they stand out and are an important element in the overall enjoyment and better understanding of Mr. Hatcher’s play, along with the creative and inventive fingerprints of director Ellenstein, who once again has a winning production on his hands. 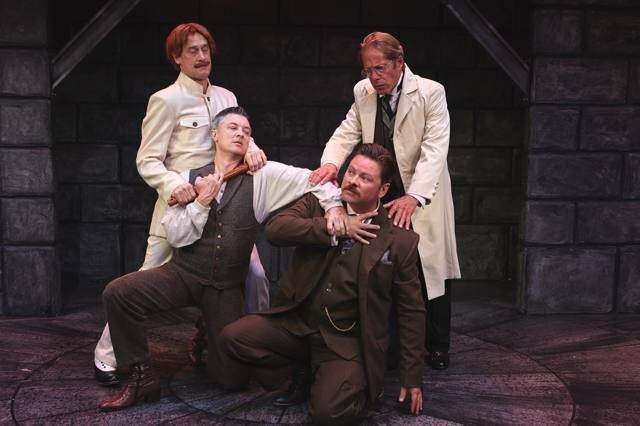 “Holmes & Watson” is an impressive production that is performed without an intermission (approximately 90 minutes) at the North Coast Repertory Theatre, Solana Beach, CA. The mystery/drama runs through November 18, 2018.